As you may have heard, grouse were depressingly scarce in Wisconsin last fall. So when Tina’s bell went silent near the top of the sidehill aspen cut, a little buzz of adrenalin surged through me. I picked my way up the slope and spied her, tense as a drawn bow, off to my left. She was standing in the thin, pointing back at the thick. I took a few steps in her direction, and when at first nothing happened, I began to wonder if she’d pinned a tight-holding woodcock. But it was, indeed, a grouse: a beautiful reddish-brown bird that roared out on a rising left-to-right vector and gave me as clear a look as I’d had all season. I swung the Fox to intercept it . . . and then, inexplicably, found myself slip-sliding away. What felt like solid ground was, in fact, a film of soil laminated tenuously to angled rock, and as I shifted my weight to shoot, the film came loose. Gravity took care of the rest. A solidly pointed grouse right in my wheelhouse, and I had all I could do just to stay on my feet. I felt like a character in one of those old Life’s Darkest Moment cartoons. Still, if grouse were few and far between in Wisconsin last season, it was no reflection of either the quality or the quantity of the cover. And much of this cover, including the spot just mentioned, is under county ownership. There’s an astonishing 2.4 million acres of county-owned public forest in Wisconsin—almost all of it in the western, central and northern parts of the state. Which is to say: the heart of Wisconsin’s grouse and woodcock range. But it gets better. According to the Wisconsin County Forests Association, some 887,000 acres of that total are dominated by aspen—or, as it’s often called in the Great Lakes region, popple. By any name, it’s the tree whose presence makes grouse and woodcock hunters stop and take notice and whose absence makes them keep their feet on the gas. When biologists talk about grouse and woodcock being birds of “brushy young forests in the early stages of succession,” what they’re seeing in their mind’s eye is a 10- to 20-year-old aspen cut. “Cut” is definitely the operative word here. Logging older, past-its-prime aspen is what creates young, productive aspen, and by-and-large Wisconsin’s most aggressive cutting programs—and its most intensive aspen management—are taking place under the auspices of its county governments. It’s a classic win-win: Revenue from timber sales helps fill the county coffers while at the same time creating thousands of acres of prime grouse and woodcock habitat. Some of the best of this habitat is found in designated Grouse Management Areas (GMAs). 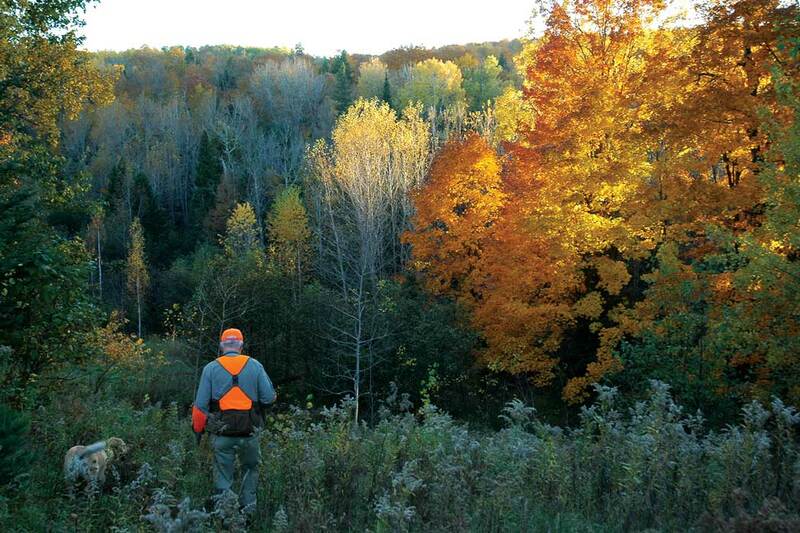 Resulting from a cooperative program involving Wisconsin’s county forests and the Ruffed Grouse Society, these areas are managed expressly for grouse and woodcock and typically feature several miles of well-maintained hunter walking trails. Detailed maps of the areas are available online, and some even show an area’s cutting history, allowing you to pinpoint the age-class of aspen where you’d like to focus your efforts. Check them out.